As I have noted in a previous post, UN Mideast envoy Robert Serry told the Security Council has already told the council that there have been 13 reported uses of chemical weapons in Syria. Why is the 13th time crossing the "red line" the crucial step? Obviously, Obama seems to be trying to set it up so that he can blame Congress, but shouldn't he have consulted with them before making the threats? Indeed, up through Friday, the administration was indicating that it was going through with the war without consulting Congress, just as he hadn't consulted congress with respect to Libya. Here is a text of Obama's statement. while I believe I have the authority to carry out this military action without specific congressional authorization, I know that the country will be stronger if we take this course, and our actions will be even more effective. We should have this debate, because the issues are too big for business as usual. And this morning, John Boehner, Harry Reid, Nancy Pelosi and Mitch McConnell agreed that this is the right thing to do for our democracy. . . .
Here’s my question for every member of Congress and every member of the global community: What message will we send if a dictator can gas hundreds of children to death in plain sight and pay no price? Chuck Todd has this interesting discussion after Obama's talk on Saturday. White House aides said they are fairly confident that Congress will grant them the authority to launch a strike, although they maintain that Obama would be acting within his constitutional authority even if Congress rejects the authorization and Obama orders military intervention. . . . The administration decided not to call them back early due to the Jewish holidays this week, a delay that the Pentagon also signed off on, saying that the wait won’t diminish U.S. military capabilities in the region. There’s an upside to that cooling-off period too, aides said. . . .
Obama may still go forward with the attack even if Congress doesn't grant him the authority? Is that right? In addition, the fact that the U.S. military says that its ability to successfully attack Syria won't diminish after a month is not the same thing that it is wise to wait that long. For example, our ability to lob a few cruise missiles into Syria and hit the targets that we want might be significantly degraded if Syria has a month to move assets around. UPDATE: Larry Elder has a very useful piece available here. See also this. Comments on "Booming oil production boosted GDP estimate, White House advisers say"
Two of President Obama’s top economic advisers are crediting increasing petroleum production with the rosier estimate for second quarter economic performance announced this week. . . . The United States petroleum trade deficit hit a record low in June as booming domestic oil production displaced imports and exports of refined petroleum products increased. That played a significant role in revising U.S. gross domestic product growth in the second quarter to 2.5, up from 1.7 percent, said Furman and Sperling. . . .
Four senators – two from each party – say President Obama should not allow a State Department inspector general (IG) probe of the Keystone XL pipeline review process to further delay a final permit decision. The IG recently said its review of the department's selection of a contractor analyzing the project would bleed into 2014, raising the prospect that a federal permit decision could await the outcome. Sens. John Hoeven (R-N.D.), Mary Landrieu (D-La. ), John Thune (R-S.D.) 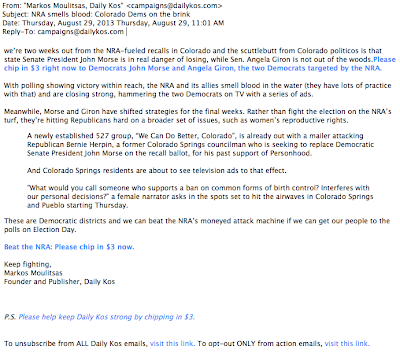 and Max Baucus (D-Mont. ), all pipeline backers, together issued statements Thursday criticizing the potential for more delays in the five-year federal review. “This tactic of delay and deferral must stop. It is depriving America of jobs, hurting the American economy and hurting the American people,” Hoeven said in one of the statements, which underscore efforts by pipeline backers to keep political pressure on the White House. . . .
“We cannot sit by while excuse after excuse delays jobs in Montana and across the country,” Baucus said. “We've had years of studies and the President's own State Department has repeatedly concluded the environment won't be harmed. It's past time to put Americans to work building the Keystone pipeline.” . 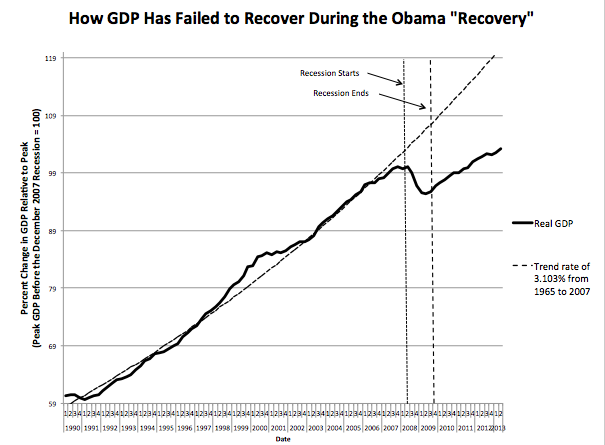 . .
Is the Obama administration claiming credit for the growth from increased oil output just a little too ironic? Fox News has the discussion here.
. . . A 28-year-old native of Norway, Rugland had been the subject of intense interest this preseason with outlets from Sports Illustrated to GQ to Norwegian television stations and newspapers descending upon the Lions' Allen Park, Mich., facility to chronicle his long-shot bid for an NFL roster spot. Rugland, who had no football experience before his video caught the eye of a New York Jets personnel man last year, showed marked improvement during his time in Detroit. He made all three of his field goal attempts in the preseason, from 49, 50 and 33 yards, handled kickoffs in the second half of most games and was popular in the locker room. But the Lions always intended to use six-time Pro Bowl pick David Akers, if healthy, as their replacement for Jason Hanson, who retired this spring. . . . Gun control advocates point to Tom Smith's General Social Survey to claim that gun ownership is declining. While that survey is pretty much all by itself and Smith long ago indicated to me that he strongly favors gun control, the GSS survey still gets a lot of attention. There is lots of other evidence that indicates that there are problems with the survey. 1) Concealed handgun permits have doubled since 2007. 2) "New target shooters--those who have taken up the sport in the last five years--are younger, female and urban when compared to established target shooters, or those participating for more than five years, according to a survey commissioned by the National Shooting Sports Foundation. . . . Younger: 66 percent of new shooters fall into the 18-to-34-year-old category compared to 31 percent in the same age category for established shooters. . . . The report shows that one-fifth of target shooters in America first started participating in the shooting sports between 2008 and 2012."
. . . Sweden was the world’s third-richest country in 1968 but became a massive welfare state in the 1970s and 1980s and a prototype for how not to run an economy. It slid to No. 17 in the global income rankings and experienced a deep financial and real estate crisis in 1991, according to a 2012 study from the Research Institute of Industrial Economics. To its enormous credit, Sweden reversed course with consummate skill and political courage; it has become a paragon of sensible economic and social policy. Sweden’s economic growth has been much higher than that of the rest of Western Europe, or the United States, since 2006. Data from the International Monetary Fund and the Organization for Economic Cooperation and Development show that Sweden has one of the lowest inflation rates in Europe; it runs a budget surplus every year; its corporate tax rates are considerably lower than U.S. rates; and it spends more on research and development, as a share of its economy, than we do. . . .
After its crisis, Sweden reduced public expenditures by 20 percent of its gross domestic product, slashing social transfers such as unemployment benefits and sick-leave compensation. It cut its public debt in half (its debt, as a proportion of the economy, is now about half that of the United States). It cut marginal tax rates and simplified its tax code so much that nearly two-thirds of Swedes simply confirm by phone that the declaration automatically prepared for them by the tax authorities is correct. . . . Structural reforms were also adopted. Successive governments deregulated one market after another and privatized as market conditions permitted. All children receive vouchers so their parents can choose private or public schools at public expense. Swedish social security became a true insurance system, rather than a pay-as-you-go one with huge unfunded liabilities as in the United States. . . . .
Did the organizers of the "March on Washington" wait until the week before the event to invite some of the Democrats who spoke? It would be interesting to see how long in advance the Democrats were invited to speak (also here). Some of these Democrats don't appear that obviously important. Cory Booker, Mayor of Newark, N.J.
. . . After it became clear that big-name Republicans like the Bushes were not going to be able to attend, RNC officials offered help in finding one or more appropriate Republican speakers, according to Sean Spicer, the RNC’s communications director. Starting August 14 – two weeks before the commemoration — GOP officials offered help in reaching out to a range of other Republicans. That list, according to an RNC official, included Scott, who is the only African-American currently in the Senate; former Rep. J.C. Watts, R-Okla., who is black; and T.W. Shannon, the 35-year-old African-American speaker of the Oklahoma House of Representatives. Organizers did invite several prominent Republicans – including both Presidents Bush, former Gov. Jeb Bush, former Gov. Mike Huckabee, House Speaker John Boehner, House Majority Leader Eric Cantor, and Sen. John McCain – to speak. They also reached out late in the planning process to the office of Rep. James Sensenbrenner, a veteran congressman from Wisconsin who has been prominent on voting-rights and sentencing-reform issues. All of those invited declined, however, with the two former presidents citing health concerns, and the others pointing to scheduling conflicts. Cantor was invited just 12 days before the event, and Huckabee told ABC News he was invited just last week – too late for him to juggle other commitments. “I was invited and so wished I had been able to do it,” Huckabee said in an e-mail to ABC. “I didn’t receive the invitation until last week, however, and it was too late for me to re-arrange things.” . . .
Brazile said she assumed Scott was invited to speak. Other organizers said that when he didn’t respond to an invitation sent to all members of Congress months ago – to attend, though not necessarily to speak – that he was assumed to be unable to attend. . . . Surely the organizers realized that inviting someone to sit in the audience is hardly the same as inviting them to speak. “Overlooking Tim Scott would be like overlooking the president for the State of the Union speech,” he said. And looking at a speakers’ lineup that included lower-profile Democrats such as Rep. Marcia Fudge, D-Ohio, and Rep. Donna Edwards, D-Md., there were plenty of other “nationally known” black Republicans who could have been included, he said. . . .
A Hamilton man who shot and killed an intruder last week at his Parrish Avenue home will not face criminal charges, according to Butler County Prosecutor Michael Gmoser. Robert Shoemaker, 38, who was stabbed multiple times on the night of Aug. 22, was justified in the shooting of his attacker Chad Gabbard, according to officials. The incident was investigated by Hamilton police and presented to a Butler County grand jury this morning. “The grand jury reported that no criminal charges would result against Robert Shoemaker and is finding that the death of Chad Gabbard was justified,” Gmoser said. . . .
Shoemaker was stabbed by Gabbard three times in the neck during a robbery attempt, according to Hamilton officials. He was transported by paramedics to West Chester Hospital, but has been released from the hospital. Police received a 911 call from a woman who identified herself as Loretta Shoemaker, Robert’s mother. “I need an ambulance and police and stuff,” she said. “My son just hollered and told me he had been stabbed. He shot someone … yeah, he needs help. He’s got blood all over him.” . . . The Mississippi Supreme Court on Thursday unanimously upheld the state’s open carry-gun law, allowing it to take effect after a circuit judge’s order had kept it on hold about two months. . . .
. . . Several officials, including the Hinds County district attorney, sued to block the law, saying there could be chaos if people were openly carrying guns in public places. Circuit Judge Winston Kidd put the measure on hold just before it was to become law July 1. After hearing arguments, Kidd issued an injunction July 12, saying the law was on hold until the Legislature can clarify it. . . . So the official date that the law goes into effect is August 29th. It sure sounds scary. "Military weapons" being reimported back into the United States. Or people getting guns without background checks. But the reception being given President Obama's two new executive orders on guns largely relies on ignorance of how the current rules work. The president's executive order banning the reimportation of "military weapons" really only affects old M-1 Garand 30-06 rifles. These rifles have been used in the Civilian Marksmanship Program program and are mainly purchased by collectors. At one time they were &quotmilitary weapons,&quot but they were used in World War II and the Korean War. No other US-made military rifles are being imported. And, more importantly, this semi-automatic rifle is functionally no different than any semi-automatic deer hunting. They fire the same bullets at the same rapidity and do the same damage as other deer hunting rifles. . . .
One of the emails that I received about the op-ed. A list of the guns is available here, but the Garand semiautomatic rifle is the only one of any real significance. Most of the others are extremely old guns (Marlin, Model 1894 or Winchester, Model 1894). Why the sudden rush on Syria by Obama? What is the logic of his policy? A Free Syrian Army source told Al Arabiya the death toll stood at 1,188, while the Local Coordination Committees said some 785 people were killed. A nurse at an emergency clinic in Douma told Reuters the death toll was at 213, and the head of the Britain-based Syrian Observatory for Human Rights said 40 were confirmed dead and the death toll could reach over 200. . . .
. . . UN Mideast envoy Robert Serry told the Security Council last month that the UN has received 13 reports of alleged chemical weapons use in Syria. . . . Even Bush got approval from the Congress before he made strikes and Bush went to the UN Security Council, but to Obama that wasn't enough. Now the Obama administration's answer is that they have tried to use the UN Security Council for many months but have been consistently blocked by the Russians. Would Democrats have been satisfied with this response? Here is an absolutely devastating critique of Obama's policies in Syria. Finally, it is interesting to see that in the UK they went to parliament to get approval. But possibly Obama is worried that if he went to Congress he would face a similar rejection. Also it is interesting to note that Canada, a country that has consistently stood by the US on these missions, is declining to get involved. • After demonstrations calling for Assad's ouster began in March 2011, Obama essentially ordered the dictator in April to stop killing demonstrators and to "change course." • Then in August 2011, Obama and Turkish Prime Minister Tayyip Erdogan gave Assad an Aug. 27 deadline to stop the violence and start implementing democratic reforms, or else risk joint U.S.-Turkish military action. The deadline passed, Assad continued killing his people and the U.S. did not do as it warned. • On June 22, 2012, Secretary of Defense Leon Panetta says the U.S. won't give arms or other aid to Syrian rebels. • On Dec. 3, 2012, Obama warns Assad that "if you make the tragic mistake of using these weapons, there will be consequences and you will be held accountable." Secretary of StateHillary Clinton says the U.S. will take action if chemical weapons are used. 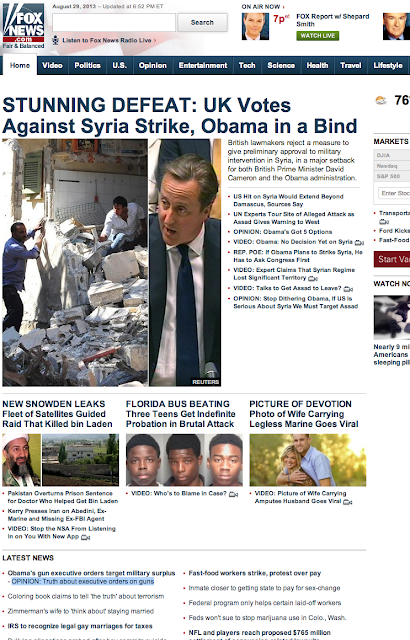 • News reports from the on Pentagon Dec. 7, 2012 describe contingency planning for U.S. military action in Syria. • Somebody uses chemical weapons March 19, 2013 and Obama says the U.S. is seeking conclusive evidence of who is responsible. 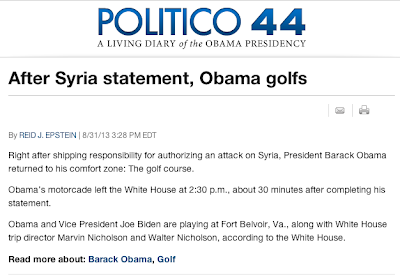 • Obama says on April 30, 2013 that he still doesn't have proof that Assad used chemical weapons. 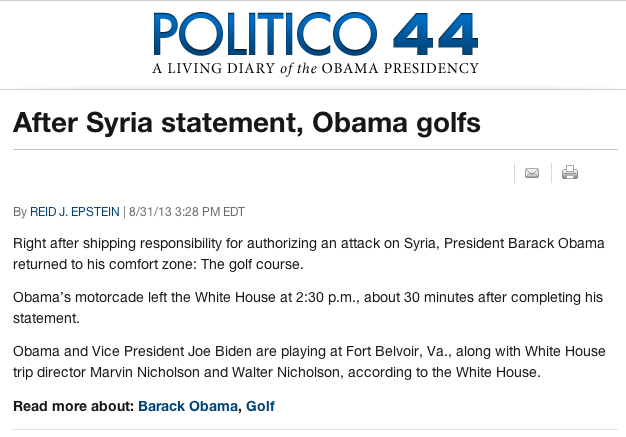 • Unnamed White House officials say June 14, 2013 that Obama has opted to use military force against Assad. • August 2013. Amid multiple leaks and background reports from unnamed administration officials, it appeared initially that Obama would order a significant military action. Now, a limited cruise missile attack that does little if anything to stop Assad's murderous attacks on his own people appears more likely. . . . The Associated Press has this very poorly done piece on the proposed changes. 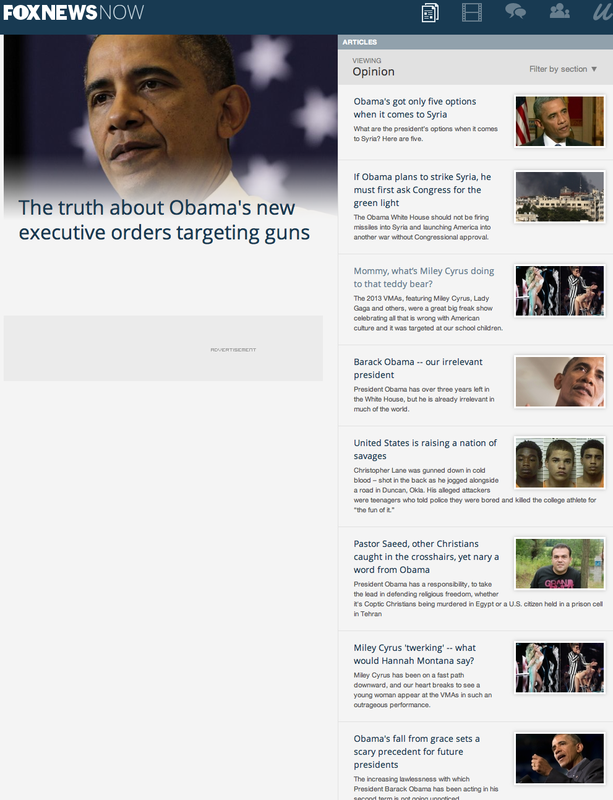 These executive orders rely on the typical ignorance of the media regarding guns. The Obama administration is also proposing a federal rule to stop those who would be ineligible to pass a background check from skirting the law by registering a gun to a corporation or trust. The new rule would require people associated with those entities, like beneficiaries and trustees, to undergo the same type of fingerprint-based background checks as individuals if they want to register guns. . . .
1. The only "military weapons" that are affected by this are old M-1 Garand 30-06 rifles used in the CMP program, available to collectors mainly. No other US-made military rifles are being imported. And more importantly, how is this semi-automatic rifle functionally different than any semi-automatic deer hunting? The only difference that I know is that these old Garands tended to be pretty heavy. I know of no cases when any imported US-made military weapon has been used in a crime. 2. 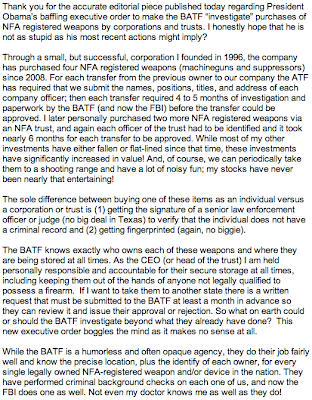 The only "corporate" registration I'm aware of is for Class III (machine guns) weapons. I've never known an individual to use a corporation to register a handgun or other firearm to bypass a background check. Corporations are used (primarily) to obtain fully-automatic machine guns, as they are usually out of the price range of most citizens (minimum of $20,000 each). Yes, when registered to a corporation any officer is allowed to posses the machine gun, but my understanding that at the point that the transfer occurs there has to be a NICS check for the person actually picking up the gun. What happens under current law is that if a gun is registered to a corporation, then anyone who is an officer in the corporation would be allowed to use the gun I don't see how he can make this change without these rules without congressional action. I know of no case where someone who was barred from getting a gun was able to obtain a gun through the mechanism that the president is pointing to. No crime has occurred as a result of this loophole. New York City Mayor Michael Bloomberg has thrown $350,000 behind an effort to fight the recall of two Colorado Democratic legislators for their votes in favor of sweeping new gun control laws. Campaign finance paperwork filed Tuesday and obtained by KDVR.com showed that Bloomberg wrote a personal check to Taxpayers for Responsible Democracy, the group fighting the recalls targeting Colorado Springs Senate President John Morse and Sen. Angela Giron, of Pueblo. The National Rifle Association has contributed more than $108,600 to try to unseat the Democratic incumbents. Most of the money has gone toward radio, Internet, and cable ads, as well as billboard advertising. But backers of Morse and Giron have given bigger donations, most notably Bloomberg's contribution. Bloomberg's Mayors Against Illegal Guns group has pushed for more restrictions on firearms in states nationwide, including Colorado. Billionaire Philanthropist Eli Broad also contributed $250,000 to the Democrats' campaigns. . . . Thus just between Bloomberg and Broad, those two individuals have contributed 2.6 times more money than they spent on their campaigns in 2010. But this isn't all the money that they have gotten. The liberal "We Can Do Better Colorado" campaign raised $395,000, of which two $100,000 donations came from the Service Employees International Union and the American Federation of State, County and Municipal Employees. 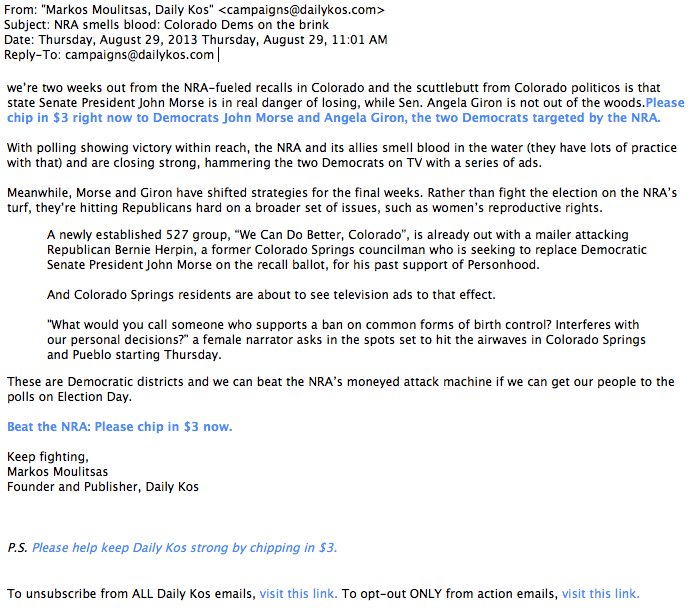 I have also gotten this type of email from left wing groups multiple times. 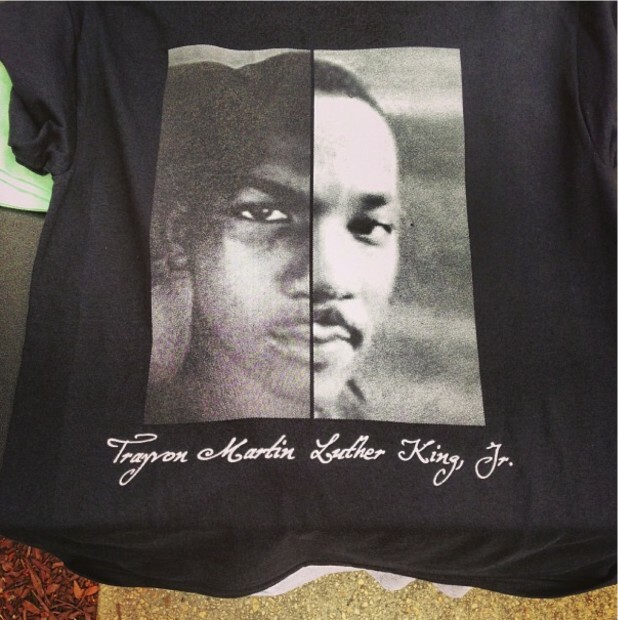 Shirt "sold by vendors in D.C. today as America commemorates the 50th anniversary of Martin Luther King Jr.’s 'I Have a Dream' speech." “The task is not done, the journey is not complete. The vision preached by my father a half-century ago was that his four little children would no longer live in a nation where they would judged by the color of their skin but by the content of their character. However, sadly, the tears of Trayvon Martin’s mother and father remind us that far too frequently the color of one’s skin remains a license to profile, arrest, and to even murder with no regard to the content of one’s character." Performers also included Peter Yarrow and Noel Paul Stookey, their voices thinner now than when they performed at the original march as part of the folk trio Peter, Paul and Mary. They sang "Blowin' in the Wind," as the parents of slain black teenager Trayvon Martin joined them on stage and sang along. . . . The struggle continues. So said many of those who turned out Wednesday for the 50th anniversary of the March on Washington, saying they were there to mark the historic occasion but also to call attention to causes ranging from joblessness to "justice for Trayvon Martin." . . .
"still too much apathy when the lives of people of color are too often valued less than the lives of white people." The most memorable moment of the march occurred when Trayvon Martin's family walked within feet of where I was standing. I wanted so badly to say something to them -- but nothing I could conjure up in a few seconds could convey the anger, grief, and helplessness I felt towards the tragedy of their loss. Trayvon's presence was felt throughout the entire event, making me question how much progress we've truly made in these 50 years. If I still share Dr. King's dream in 2013, what have we accomplished? . . . .
A mass email sent out to the Chicago entire Teachers Union’s mailing list urges union members to attend the march to protest foreclosures, the Second City’s recent rash of school closings and, of course, the verdict in favor of George Zimmerman, a Hispanic man who shot a black teenager during an altercation. “The attack on the working people of Chicago and the country — school closings, high rates of unemployment, evictions and foreclosures, mass incarceration of our youth, lack of access to affordable health care and clinics — highlights the structural racism in our society,” the email beseeches. “We are marching for Trayvon, for jobs, for schools, for health care, for justice and for dignity.” . . .
[Rep. John] Lewis said he never thought 50 years later that some of the same issues would be back on the table. "I thought we had completed the fight for the right to vote, the right to participate in the democratic process. I thought we were in a process of reforming the justice system. But when I see something like what the Supreme Court did, or what happened to Trayvon Martin, it tells me over and over again that we're not there yet. We have not finished." (Lewis was referring to the verdict in the killing of unarmed black teen in Florida, and the Supreme Court's decision in June striking down a key part of the Voting Rights Act of 1965.) . . .
HANNITY: . . . Juan, I'll start with you. You know, a lot of people, there have been numerous high-profile cases that the American people are following. For example, the president spoke out on the Cambridge police acting stupidly, spoke out about Trayvon, but yet has not spoken out publicly -- I know he sent a letter to the family earlier today -- about the Chris Lane case, an 88-year-old World War II veteran beaten, a Florida bus beating, three kids, black kids against one white kid. And some people question why these civil rights leaders, why the president are selective in the instances in which they speak out on? JUAN WILLIAMS, FOX NEWS POLITICAL ANALYST: Well, you can't speak out on every crime in America, Sean, I don't think by the way that the racial cover you would put on those is always the case. Certainly not in Oklahoma where you had one kid who was white and another who's biracial involved in that shooting. I think that there are criminals of all colors and types. HANNITY: You mean like the Trayvon case? Was there inflaming racial tensions there? WILLIAMS: Sure, I think that -- I think there are people who tried to exploit it. I happened to think that the verdict was an injustice to Trayvon Martin's family because I think there's a dead child there. WILLIAMS: But that's my feeling. HANNITY: All right, Larry, weigh in. LARRY ELDER, RADIO TALK SHOW HOST: Well, the so-called black leaders don't like to talk about the fact that when you're talking about black/white violent crimes, most of the time it's a black perpetrator and most of time it's a white victim. It's much easier to talk about the rare instance when a white person does something violently to a black person. The fact is that the criminal justice system is not a racist criminal justice system. In 1994, the Justice Department examined 75 major metropolitan areas to find out if it's true that blacks got longer sentences for the very same sentences because of racial reasons. They found out nothing like that, this is 1994 under Bill Clinton. And yet, the mantra continues that race and racism remain major problems in America. It just isn't true, we've elected and re-elected a black president. We've had back to back black secretaries of state. If black America were a separate country, Sean, it would be the 15th or 16th wealthiest country in the world. . . .
On a related note, former Secretary of State Colin Powell commented on the Trayvon Martin case this past Sunday. He called the jury verdict "questionable." Interestingly, I found a post noting that Powell had a different view of the OJ Simpson verdict. The crowd in 1963 was about 250,000 people. The crowd on Wednesday was only about 20,000. States experiencing a larger-than-average increase in families with an unemployed parent between 2005 and 2011 included Nevada (148 percent), Hawaii (95 percent), Florida (93 percent), Connecticut (65 percent), New Jersey (63 percent), California (61 percent), Colorado (56 percent) and North Carolina (54 percent). Estimates for many of these states do not differ from one another. The recession affected families in other ways as well. For instance, 24 percent of married mothers with children under 15 were stay-at-home parents before the recession began in 2007. 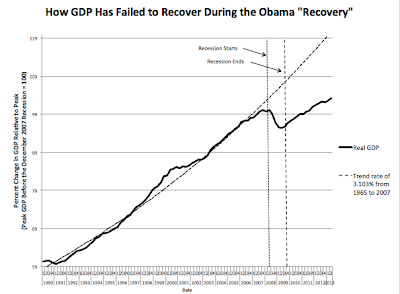 The rate dropped to 23 percent in 2009 and only returned to its prerecession level in 2012. On the other hand, the percentage of married fathers who were stay-at-home parents remained unchanged between 2006 and 2010, then rose slightly in 2011 and 2012 to a higher rate than prior to the beginning of the recession. The percentage remains below 1 percent, however. Furthermore, the number of householders with children under 18 who owned their home declined by 15 percent to 20.8 million between 2005 and 2011. In parts of the country, this decline was even sharper. Over the same period, the six states with among the steepest drops in homeownership among households with children were Michigan (23 percent), Arizona (22 percent), California (22 percent), Ohio (20 percent), New Hampshire (19 percent) and Florida (19 percent). Estimates for many of these states do not differ statistically from one another. . . . .
Bill Clinton: "But a great democracy does not make it harder to vote than to buy an assault weapon." Srsly? Bill Clinton: "But a great democracy does not make it harder to vote than to buy an assault weapon (APPLAUSE)." It is extremely difficult for me to believe that he doesn't clearly know that this is false. Most states right now don't require voter IDs to vote. Those that do have a requirement make free IDs available (e.g., Georgia, Indiana, Pennsylvania, Texas). Yet if you buy a gun from any dealer in the US you have to have a photo ID and those IDs aren't provided for free. 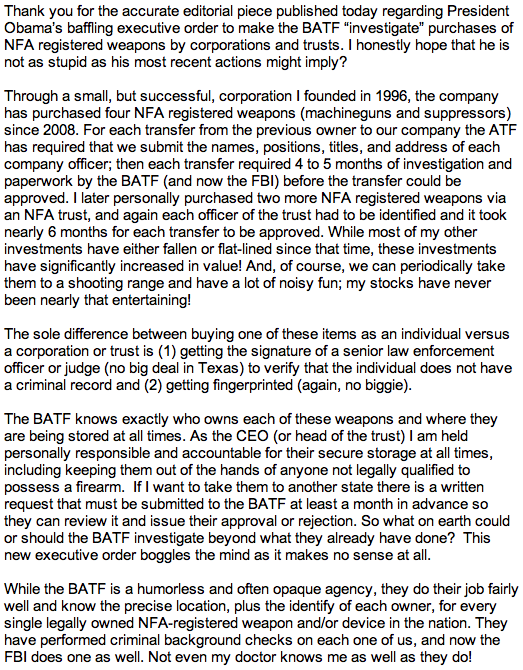 Plus, one has to pay the Federally licensed firearms dealer for handling the transaction. There is no similar fee for voting. The problem is that Clinton was willing to make a false claim as a way of helping to make a racially divisive claim. The Obama administration has delayed a step crucial to the launch of the new healthcare law, the signing of final agreements with insurance plans to be sold on federal health insurance exchanges starting October 1. The U.S. Department of Health and Human Services (HHS) notified insurance companies on Tuesday that it would not sign final agreements with the plans between September 5 and 9, as originally anticipated, but would wait until mid-September instead, according to insurance industry sources. Nevertheless, Joanne Peters, a spokeswoman for HHS, said the department remains "on track to open" the marketplaces on time on October 1. The reason for the hold-up was unclear. Sources attributed it to technology problems involving the display of insurance products within the federal information technology system. . . . But the October 1 deadline has already begun to falter at the state level, with Oregon announcing plans to scale back the launch of its own marketplace and California saying it would consider a similar move. Tuesday's notification by the Centers for Medicare and Medicaid Services, the HHS agency spearheading marketplace development, affects insurance plans that would be sold in federal exchanges that the administration is setting up in 34 of the 50 U.S. states. The remaining 16 states, including Oregon and California, are setting up their own marketplaces. "It makes me wonder if open enrollment can start on October 1," said a former administration official who worked to implement Obama's healthcare reform. . . .
Fox News has a story on the delay available here. President Obama told a collection of big-city mayors Tuesday at the White House that he would continue to use executive actions to combat gun violence plaguing major cities. In the meeting with Attorney General Eric Holder and the mayors of 18 cities from across the nation, Obama discussed commonly applicable strategies to reduce youth violence. "He also vowed to continue doing everything in his power to combat gun violence through executive action and to press Congress to pass common-sense reforms like expanding the background check system and cracking down on gun trafficking," the White House said in a statement. . . . In March, I wrote an op-ed about how the common theme in Democrats push for gun control is to impose taxes on purchases or transfers of guns. Who do you think that such taxes primarily prevent from obtaining guns? The poor, and since a greater percentage of blacks are poor, these taxes primarily tend to disarm poor blacks. Just in case that push to disarm poor blacks wasn't obvious to everyone, a new bill to tax guns and ammunition is being pushed by two Democrats in the House. A pair of Democratic lawmakers are proposing steep new taxes on handguns and ammunition, and tying the revenues to programs aimed at preventing gun violence.Called the “Gun Violence Prevention and Safe Communities Act," the bill sponsored by William Pascrell, D-N.J., and Danny Davis, D-Ill., would nearly double the current 11 percent tax on handguns, while raising the levy on bullets and cartridges from 11 percent to 50 percent. . . .
Why do Democrats so fear poor law-abiding blacks from having guns? The taxes don't stop poor criminals from getting guns because they aren't going to be the ones paying these taxes. A brutal stabbing incident occurred in Chengdu over the weekend, leaving 11 people injured and four dead. The incident occurred on Sunday evening along Chengdu’s Caojia Alley,Sichuan Daily reported. According to surveillance videos and police investigations, the stabber, a 41-year-old man identified only by his last named Li, was on a bus when he suddenly withdrew a knife and began hacking away at fellow passengers. The bus driver promptly hit the emergency brake to let passengers exit the vehicle as quickly as possible. Li fled and ran down Caojia Alley, stabbing any bystanders that were in his way. . . .
Two Anhui police officers - called in to save a hostage from a knife-wielding man in a Bengbu city supermarket - watched him stab a 17-year-old female cashier to death on Sunday, according to security footage released by the store. Families of the victim, identified only by their surname Hu, were infuriated that two police officers, who were standing only three metres away from Hu, did nothing when the girl was being stabbed. It was only after Hu fell down to the ground, lifeless, that the officers approached and arrested the suspect who was slashing himself with a knife, according to the People's Daily. “She would not have died if the two of them had stepped up and stopped him,” a family member of Hu's said. Hu’s parents were migrant workers. She had been living with her grandmother in Bangbu, the reports said. . . .
A knife-wielding man killed two people, including a woman from the United States, in an attack in China’s capital, state media said on Thursday. The stabbing happened outside a shopping mall in downtown Beijing on Wednesday, Xinhua news agency reported, citing local police. Police detained a 27-year-old man surnamed Xiao from eastern China following the attack, which was witnessed by hundreds of bystanders, the report said. The suspect is unemployed and has claimed he is mentally ill, the report said. It did not give the names of the dead but said the other victim was a Chinese male. . . . Thanks to Victor Mair for these links.
. . . “Ed Flynn can stop with his arrogant way of lecturing me on what I need to do. I take my orders from the collective public, not from him. He takes his orders from Tom Barrett. This from a guy whose ‘fool-‘em-with-statistics-crime-strategy’ turned out to be a house of cards. Now the people of Milwaukee are paying for that snake-oil with fewer cops on the street. Why is it only a substantive conversation when he’s involved? He and Tom Barrett’s conversation is one-sided and it centers on stricter gun control for law-abiding citizens. I’m not interested in joining his blame-the-gun conversation whose goal is to browbeat me into believing that fewer guns equal less crime. That myth has been debunked in a study done by author John Lott. I am on the side of victims of crime and law-abiding citizens. I’ll converse with them. 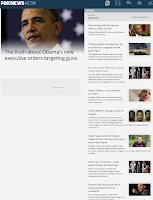 He, on the other hand, is on the anti-gun, anti-second amendment, lenient judiciary side. I have not heard him say one word about the role of the revolving door nature of the Milwaukee County criminal justice system and how that negates what officers do to keep repeat criminals off the street." . . . .
Last month, more than 400,000 adults could lawfully carry hidden handguns in Michigan. That’s one in 17 men and women 21 or older, more than since records have been kept. An MLive Media Group investigation found that crime numbers continue to drop across Michigan, even as police ranks decline. Some see the seemingly contradictory trends as proof the proliferation of concealed weapons is deterring lawbreakers. . . .
. . . 70 pages of police records obtained through the Freedom of Information Act shed light into the reasons some people carry, and what can happen. The 17-year-old in gym shorts approached his target. The 28-year-old Lansing man was waiting for his daughter at her school-bus stop at REO Road and Ballard Street. It was May 29, and a nice day. Temperatures would reach 79 degrees. It was partly cloudy, fairly gusty. The teen had two friends nearby - dropped off by a third friend in a van after they scouted their target. They knew what Marvell Weaver was going to do. They had discussed it. Weaver approached his victim from behind, a black KL-800 Type Stun Gun in his pocket. It is capable of generating 1.8 million volts. He passed him and turned back, pressed the stun gun into the victim’s side. Again and again, and … nothing. It had fired earlier when testing it, he would later tell police. “The button was like stuck down … or something. I don’t know what caused it not to work,” according to a transcript of Weaver’s statement. ‘Please don’t kill me’The intended victim moved quickly, pulling his stainless steel .40-caliber Smith and Wesson. It had a full 10-bullet magazine, and was worth about $900 police estimated. He shot Weaver in his buttocks as the teen turned to flee. . . .
. . . Major lobbying firms such as Fierce, Isakowitz & Blalock, The Glover Park Group, Alston & Bird, BGR Group and Akin Gump can all boast an ObamaCare insider on their lobbying roster — putting them in a prime position to land coveted clients. . . .
Veterans of the healthcare push are now lobbying for corporate giants such as Delta Airlines, UPS, BP America and Coca-Cola, and for healthcare companies including GlaxoSmithKline, UnitedHealth Group and the Blue Cross Blue Shield Association. Ultimately, the clients are after one thing: expert help in dealing with the most sweeping overhaul of the country’s healthcare system in decades. "Healthcare lobbying on K Street is as strong as it ever was, and it's due to the fact that the Affordable Care Act seems to be ever-changing," Adler said. "What's at stake is huge. ... Whenever there's a lot of money at stake, there's a lot of lobbying going on." The voracious need for lobbying help in dealing with ObamaCare has created a price premium for lobbyists who had first-hand experience in crafting or debating the law. . . . Speaking to a sparse crowd — perhaps 15 local supporters — Heslin said one of the simplest things that could be done “to prevent guns from falling into the wrong hands” is for Congress to pass legislation that would expand background checks for all firearm transactions, including private sales. . . . Echoing a repeated complaint from New York City Mayor Michael Bloomberg, whose Mayors Against Illegal Guns organization is sponsoring the 25-state national bus tour . . . .
As a story in the Daily Caller noted, I have seen this happen myself. This was but one of many Bloomberg embarrassments. At its stop a few days earlier in N.H., while reading off their list of “victims of gun violence,” the group called out the name of Boston Marathon bombing suspect Tamerlan Tsarnaev. “He’s a terrorist!” the Union Leader reported several protestors shouting back, objecting that someone killed in a gunfight with police would be used to justify citizen disarmament. And Tsarnaev wasn’t the only problematic inclusion. “A preliminary analysis of the list of shooting ‘victims’ … finds that one in 12 are crime suspects killed by police or armed citizens acting in self-defense,” the Washington Examiner reported. “The review of 617 killings found that 50 were suspects in crimes ranging from assault to murder…” . . .
Did surge in number of concealed handgun permit holders more than make up for the reduction in the number of police officers in Michigan?
. . . • Ann Arbor lost 31 percent of its officers, to 111. Population stayed nearly stable. Still, violent crimes dropped 11 percent; property crimes dropped 23 percent. • Lansing lost 26 percent of its officers, falling to 187. Population fell just 4 percent. But violent crime fell 8 percent, and property crimes fell 20 percent. • Saginaw lost 22 percent of its officers, to 86, and 15 percent of its population from 2003 to 2012. But violent and property crimes dropped much more, both nearly 30 percent. There are exceptions of course, Flint lost half its force and violent crime soared. Detroit lost one in four officers, but it also lost about a quarter of its population. Per capita violent crime was up only slightly, about 6 percent. Still, the downward trend in crimes and cops holds up statewide. . . .
More guns, less crimeAnother factor must be considered. Michigan adults have more guns. In 2001, Michigan made it much easier for residents to carry concealed handguns. Permits have risen ever since. Last month, 405,408 adults could lawfully carry concealed handguns. That’s up from 53,000 after the first year of Michigan’s shall-issue law. That means one in 17 adults 21 or older is licensed to carry. Countless more people have guns for sport and protection in their homes. ”When you see the percent of the population with permits rising, and how Michigan has seen a very substantial increase over almost the same period of time (studied by MLive), you are looking at the fact that victims can defend themselves and also deter criminals, just as police can deter criminals,” Lott said. . . .
Is forcing people to work for others when they don't want to a form of slavery? This last week the New Mexico Supreme Court ruled that Christian photographers can't decline certain customers based on their religious beliefs. Personally, I don't know how this gets around the "free exercise" clause in the First Amendment. The New Mexican Supreme Court claims that forcing someone to violate their religious beliefs is just "the price of citizenship." Why is government prevented from newspapers forcing to carry opposing views but perfectly OK for the government to force people to provide their time for causes that they think are wrong? Jonathan Turley has a differing view available here. Add this to the growing list of controls that government has over people's lives. For example, Obama is threatening jail to someone who wants to shutdown his business rather than turnover information on his clients to the government. "NSA employees spied on their lovers using eavesdropping programme"
The employees even had a code name for the practice – "Love-int" – meaning the gathering of intelligence on their partners. Dianne Feinstein, a senator who chairs the Senate intelligence committee, said the NSA told her committee about a set of "isolated cases" that have occurred about once a year for the last 10 years. The spying was not within the US, and was carried out when one of the lovers was abroad. . . .
Now they refer to these violations as "mainly unintentional." John DeLong, NSA chief compliance officer, said that those errors were mainly unintentional, but that there have been "a couple" of wilful violations in the past decade. . . .
Just a week ago we were assured that none of the violations were intentional. Senate Intelligence Committee Chairwoman Dianne Feinstein (D-Calif.) defended the National Security Agency’s surveillance programs Friday, saying that she has never come across an example of the NSA deliberately abusing its powers. Feinstein released a statement in response to a Washington Post report detailing thousands of privacy violations committed by the NSA every year. “As I have said previously, the committee has never identified an instance in which the NSA has intentionally abused its authority to conduct surveillance for inappropriate purposes,” Feinstein said. . . .
See also this discussion from CBS News.